Techone theme review, it’s a great theme for a Magazine, News or a Tech site from FameThemes, from developers who are authors of several highly popular WordPress themes. By using Techie you can set up a perfect blog with any kind of content, be it News or Tech based. There are many free themes which you can choose but you should know that beside creating a quality content, you also have to use a theme with great design as it can determine success of your website. What happens often with free themes is that they support stops and you are left with a unsupported theme, not so with Techone premium theme. We have already covered some of the best themes and I welcome you to have a look at our opinions. Techone is one theme that deserves a mention. I would like to present Techone theme from Famethemes because it’s really popular for tech sites and people have accepted it really well. Some of the reasons why it’s popular are a great layout, Woocommerce support and Forums support. 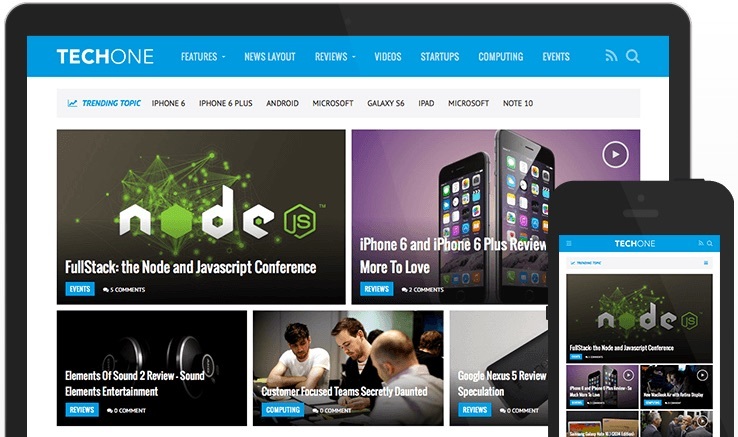 If you are looking for a modern Technology style website, Gadgets magazine Techone is one you should take a look at. Some of the features that make Techone stand out are inbuilt review system with rich snippets support that will make your content shine and increase click through rate. Techone has a modern, nice looking layout with a modern touch. It’s especially optimised for technology related websites. Navigation is one of the aspects of exceptional layout. It will highlight the most important content and social media integration will help you keep touch with your readers on the social media websites. You will like this theme as soon you will see it as it is not your everyday theme. Great design elements, quick navigation menu and post elements make this theme quite fresh. Navigation menu sits at the top featuring access to your categories and makes it easy to navigate through site, at the end it features access to your RSS feed and search box. One of the modern aspects of the Techone theme is a featured grid, grid where you list the most important stories. Stories are represented with featured images in various sizes. One the featured image you can show category, number of comments and a headline. By using images you make your content more interesting and readers are likely to engage more if you will show them interesting pictures. Did you know the people remember pictures more than words? You can use Techone slider to showcase HOT stories. With slider you can show even bigger pictures and choose the best pictures to show the content. You can have many post elements featuring your categories. The most popular elements – side by side post element and one big 3 small and blog element are present. You also have a special video element used to show your videos, either Video reviews or interviews for example. Widget area consist of 3 parts where you can show practically anything you want. If Video is present in the post, it will show a video flag on all the featured images. You won’t need any additional plugins to start a review site, Review system is integrated via in-built plugin so that you can rate reviews and have a review site. Review system has rich snippets support meaning that reviews can be shown as reviews in Google search improving chances of users coming to your website. Tech one is built with the latest technologies like HTML5 and CSS3 markup. Those technologies are important as you don’t need to worry that your website will be out of date. Techone comes with with custom widgets which you can use to build custom homepage layout. Some of the widgets are Widgets for Ads, Video widget, Popular posts widget, Custom Subscribe Widget, Social plugin and many more. Theme features clean and efficient SEO optimized code. The only worry you have if using this theme is how to create quality content for your readers. Price for the theme is $49 which is not that much if you consider all the features. If you are looking for great tech site Techone is one of the best themes. It features all the elements for a successful website. You can easily set up website and make homepage the way you want. It has in built shortcodes, review system and support for web shop and forum so that you can engage with your community even outside of your website. Techone is definitely one of the best themes.